Good morning! I hope you’ve all had a great week. We had our bathroom remodeled while we were in Texas, and the remodel was finished this week. I’m not very into bathrooms (I’m all about kitchens) and care more about function than aesthetics, but I have to say… I love this bathroom! And by *this bathroom*, I don’t mean I’m sitting in the bathroom writing this blog post. Because I’m on the couch. Promise. But the bathroom is pretty. Meanwhile, I messed up the scarf I’m knitting, and since I’d rather knit something than watch all the videos to figure out how to fix it, I’m now knitting a sock. I’m hoping to knit a second one when I finish the first one. ;) Though I’ll also go back and finish that scarf after I learn how to go back three inches without frogging the whole thing. 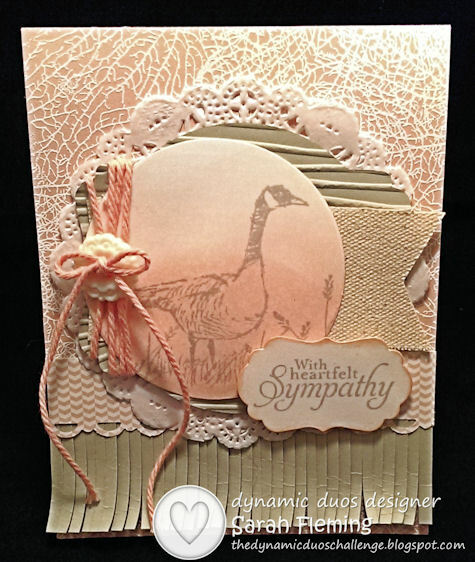 It’s “Subtly Yours” week at Dynamic Duos, and the colors are Blushing Bride and Sahara Sand. Subtles week is usually really hard for me, because I’m all about bright and bold, but this week I was able to come up with my card without *too* much teeth-gnashing. Probably because I loooove Sahara Sand — I prefer it far above Crumb Cake (or Kraft). My favorite part of the card this week is the background that I created using the coral stamp from the By the Tide stamp set. I had no intention of using the fishy theme of that set, but I wanted to add some delicate texture to the card base. So I stamped all around the edges of the card in Versamark, being careful to only stamp the top half of the coral so that you can’t actually *see* that it’s coral. This way it could be a tangle of tree branches. (Also, if you did this on black cardstock and overlapped the stamping quite a bit, this would make great spider webs for a Halloween-themed card.) After stamping all around the card base, I added the white embossing powder, then heat embossed the design. The goose is from the Wetlands stamp set. I first sponged my background in Blushing Bride ink on Whisper White cardstock. I didn’t use a sponge — I used a nearly dry baby wipe. I find that I get a much smoother coloring effect using baby wipes than I do using sponges. I stamped the goose and the extra stalks in Sahara Sand ink, then cropped the scene using one of the Circles Collection framelits. Under the goose scene, I layered a canvas banner from the little Heartfelt Banner Kit from Sale-A-Bration (free with $50 purchase), and under that is a piece of Sahara Sand cardstock cropped with one of the Deco Collection framelits and embossed with the Woodgrain folder. Under that is a Tea Lace Paper Doily. Before I adhered all the layered business to the card, I wrapped that fantastic twine around the left handle of the Deco layer several times and tacked it down in the back with Glue Dots. I ran more of the twine through the Very Vintage Button, tied the bow, and let lots of it hang down because it’s just so pretty. This is solid-colored twine that comes in one of the Sale-A-Bration items — the little embellishment kit comes with cork embellishments and three colors of the beautiful, thick, solid-color twine. Blushing Bride, Summer Starfruit, and Coastal Cabana. I can’t tell you how much I want SU! to add this thick twine in more colors to the annual catalog! I love it. I cut the fringe near the bottom of the card with the Fringe Scissors (love this versatile tool). The sentiment is from Simply Sketched (a hostess set), and I cropped it with one of the bonus thinlits that comes with one of the flip card thinlits — I think the circle one. 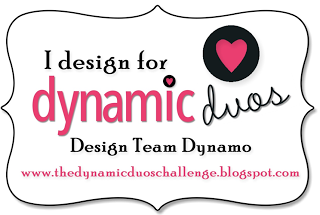 I hope you’ll join us in the challenge this week. Go see the other designers’ cards. They’re gorgeous! Wow, Sarah! What an awesome card! Lots of fun accessories and techniques! A beautiful card! Very pretty. Love your background and the fringe layer across the bottom. Great use of the colors. So many beautiful elements perfectly put together–gorgeous card! Ah, a dry baby wipe would help with the sponging. I still love pastel chalks for sponging effect- I am too heavy handed with a sponge and ink! You did a great job incorporating all your elements. TFS your process! So pretty. I love all that texture you created and what a cool looking background.